Like other businesses, restaurants and bars are required to maintain premises that are reasonably safe for customers and other visitors. But restaurants and bars bear an additional responsibility because they provide food and drinks that are consumed by customers. That means they also may be held liable for the actions of those same customers. 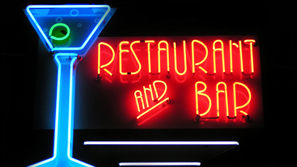 Types of restaurant and bar injuries may include simple slip-and-fall injuries, parking lot accidents, food contamination that leads to illness, on-premises assault by alcohol-impaired customers, and drunk-driving accidents caused by customers. While the responsibility for an accident that actually occurs at a restaurant or bar may be fairly clear-cut, assessing liability for a drunk-driving accident that happens an hour later and 10 miles away may be much more difficult. That’s where the premises-liability lawyers at The Law Offices of Frank L. Branson can help. If you or a loved one was injured in a restaurant or bar — or in a traffic accident involving an over-served customer — we can investigate your claim to find out who was responsible. Whether the accident was caused by improper cleaning and maintenance, a careless chef or an inattentive bartender, we may be able to help. To learn more about our experience in restaurant and bar injury related matters, we invite you to contact the firm here.